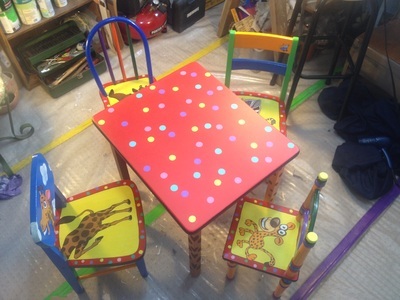 As with the grownup chairs, all the kids chairs are cleaned, sanded, hand-painted and finished with a durable polyurethane varnish to protect the art work. You may find small nicks and chips that add character for extra charm. 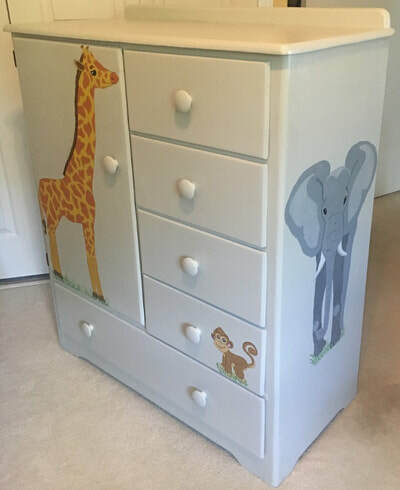 I absolutely love and have so much fun creating chairs for kids! My sweet niece, found this adorable little rocker at an estate sale. 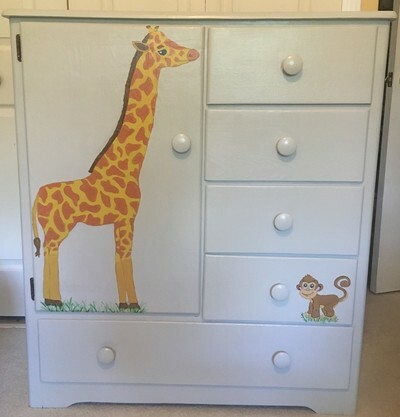 She wanted it restored and painted for her precious little niece Addison, for her first birthday gift. She wanted it to have a reading theme and also reflect Addison's love for dogs. 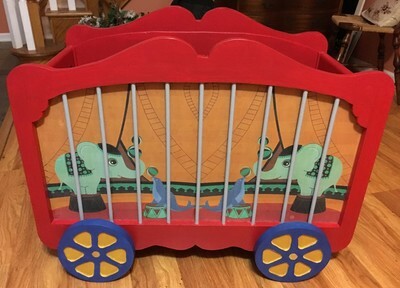 This 1950s circus toy box is one of the coolest, and most educational, projects yet. I learned a valuable lesson about the importance of primer regardless of the condition of the previous finish (despite what you might read). I also learned how to remove a dowel (the axle) from a wooden hole (the wheel) when it's stuck and won't budge (and the right drill bit for the job). And I learned that standard paper stock is much more difficult to decoupage than poster stock. But with all the challenges, it's still a favorite of mine. 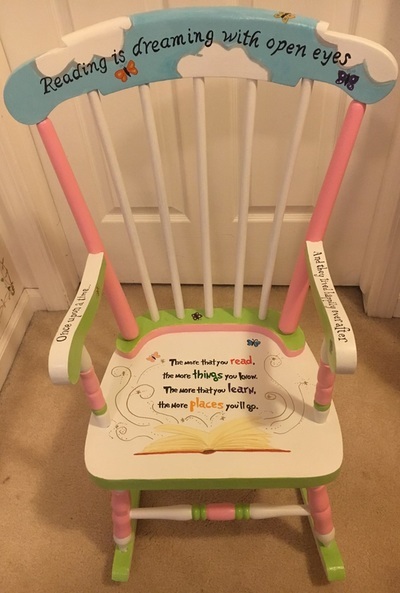 This sweet little rocker has a very sweet story! My girlfriend Colleen stored the chair in her basement ever since her daughter Shannon outgrew it. Shannon is now expecting her first baby next month and had no idea that her mom had saved it all these years. 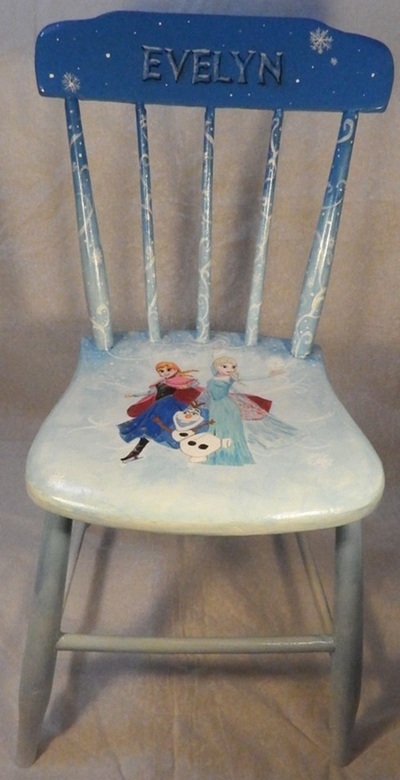 The chair was originally given to Shannon by Colleen's dad, who Shannon called "Papa". I was asked to paint it with a design that would match the nursery and also give tribute to Papa. Colleen presented the chair to Shannon last weekend at her baby shower. 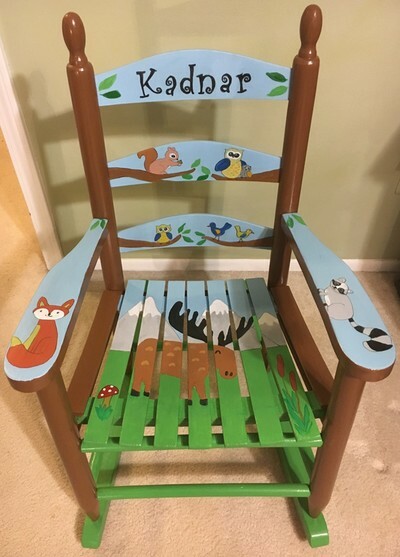 I was asked to paint this vintage children's rocking chair to match baby Kadnar's nursery theme of forest critters. I was also asked to incorporate the Detroit Tigers and Boston Red Sox. 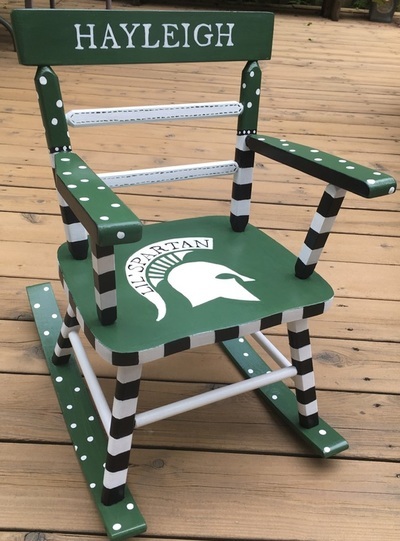 The biggest challenge was to find a design that worked with the slats in the seat, and then to add the baseball theme without conflicting the two themes too much. It was given as a shower gift and I was told it was very well received. Baby Dax received a new personalized chair from his three Godfathers. 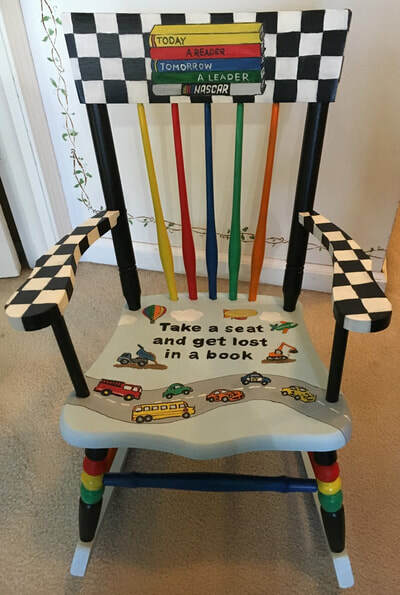 I found the perfect chair on a local group sale site and was asked to give it a reading theme that included NASCAR and a variety of vehicles. I'm so happy with the end result! 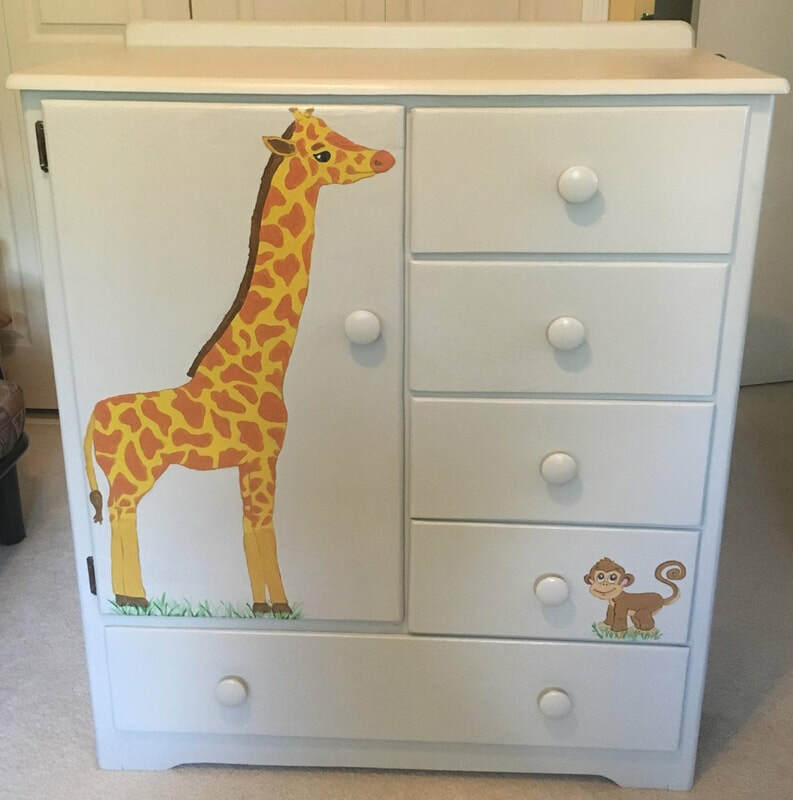 This adorable kid's desk set was found at a garage sale and brought to me for repair and a face lift. 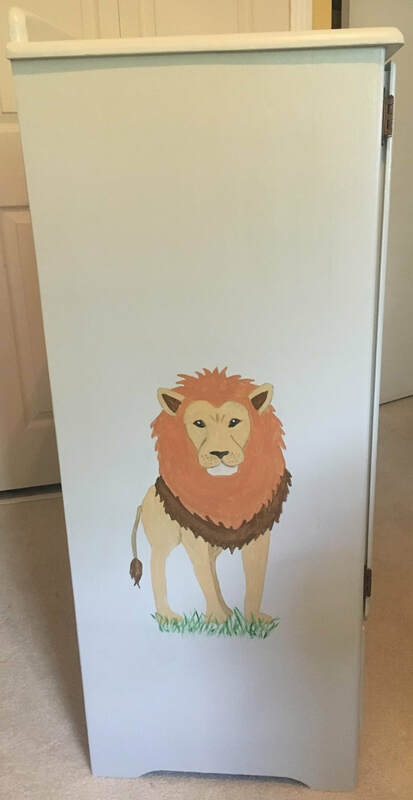 I was asked to paint it with a non-gender-specific design that was fun and busy. I offered a couple concept sketches and was thrilled she picked this design. 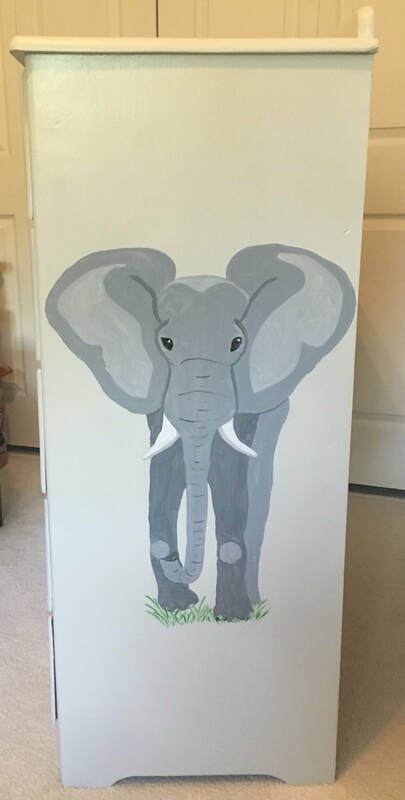 It was so much fun to paint! "You got your own style now let it come through, and remember no matter what, you got to be you.” – Sebastion in the Little Mermaid. Little Mermaid is a very popular theme for little girls! 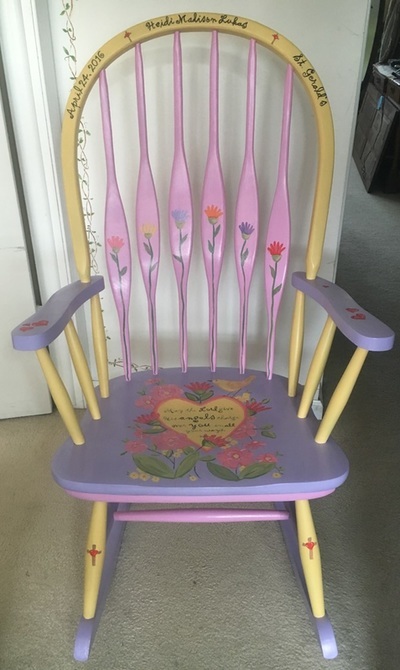 This chair was donated to me by a member of the family and was recreated for another friend who gifted it to their new great-grandbaby Charlee! 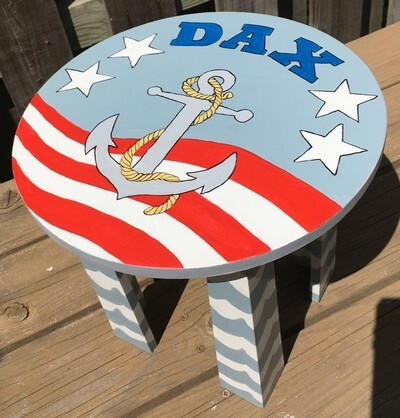 This unique little stool was painted for the new son of a member of the U.S. Navy. TO OUR MEN AND WOMEN IN UNIFORM, GOD BLESS YOU AND THANK YOU!! Dimensions: 24" tall, seat is 14" deep and 15" wide, seat-to-floor 10.5"
I found this child's rocking chair at the Knightsbridge Antique Mall. To the best of my research, it appears to made from Heartpine. (Heartpine is the actual heartwood of the tree. Since pine used to be quite large when it was logged some hundred years ago, the pine trees were able to grow large enough to develop heartwood. Now that's not the case, as pine trees don't grow as big because they are harvested at an earlier age.) It's a beautiful heavy and sturdy chair with country appeal and a rustic lodge/cabin feel. I chose art work with those features in mind. 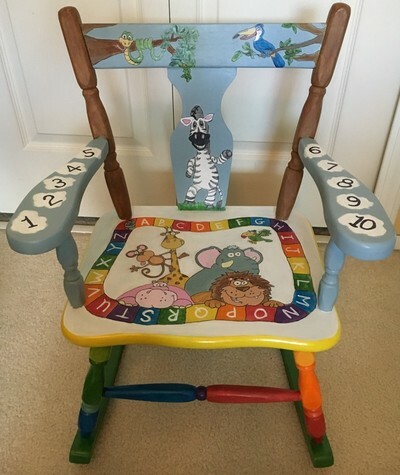 I was asked to refinish this sweet child's rocking chair for a friend who used it herself as a young child and is now a grandmother. She chose a safari theme. It needed to have the old finish sanded off, a new seat made and upholstered and some minor repairs. 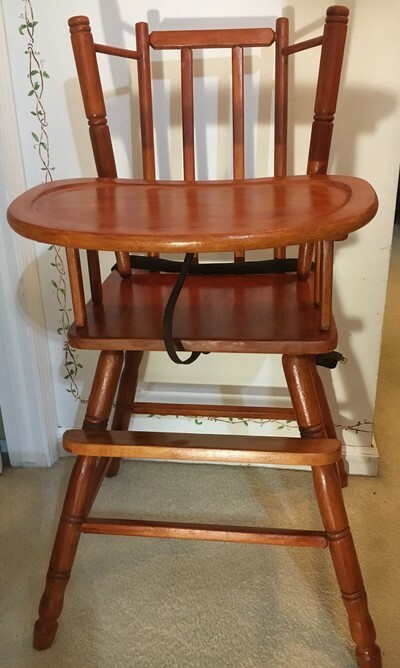 The owner of this high-quality highchair had become a grandmother, for the second time in one month. 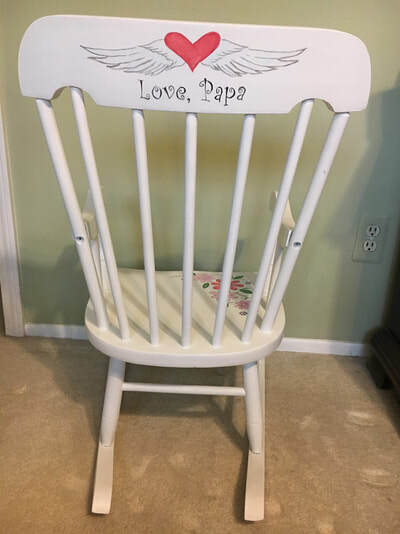 So, she decided to have the beautiful high chair, which she used for her own children, refinished to use for her new grandchildren. I was able to put my non-toxic stain and varnish to good use on this project. I also learned to how to make a DIY, non-toxic leather conditioner from beeswax, almond oil and cocoa butter to give the leather straps a fresh new look. 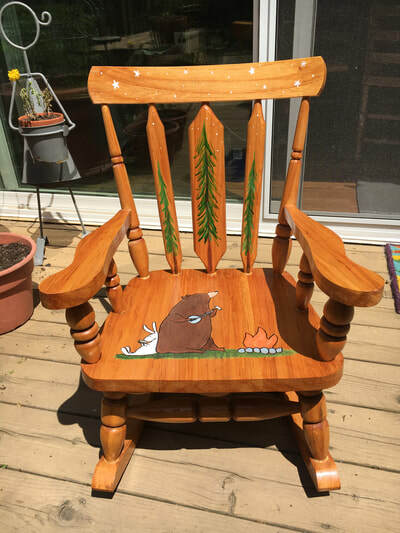 This chair was brought to me by a new grandpa who wanted to have a fun rocking chair for his new grandson (as well as future grandchildren). It was his own childhood rocker and it's so cool to know that it'll be enjoyed by another generation who will be able to relax, learn, read and be loved in their perfect-sized chair. 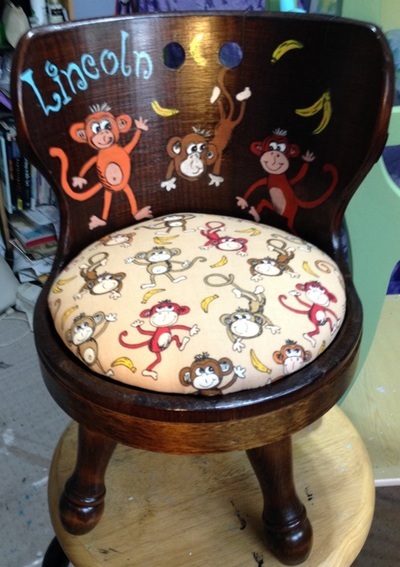 Another old childhood chair has been given new life so that another generation can enjoy it. 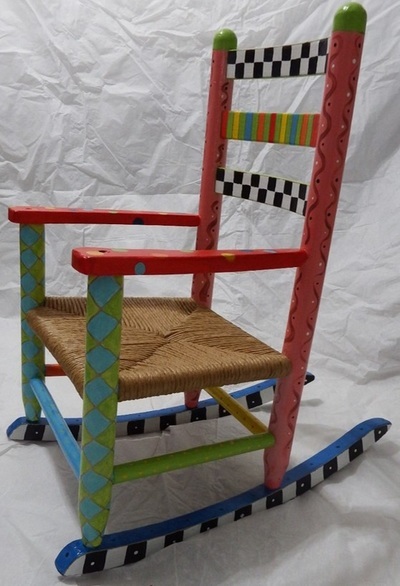 Whether it's the "Time Out" chair, or just the thinking, reading or resting chair, it's bright colors, patterns and messages make it a fun unique chair any child would love. 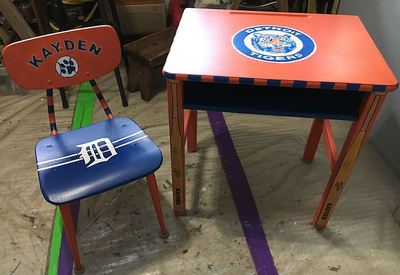 This 1960s child's desk and chair set was given to 4-year-old Kayden by his grandparents for his 4th birthday. Go Tigers!! 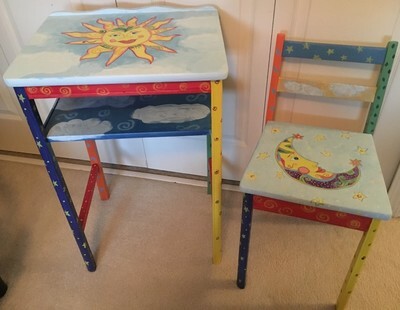 These chairs were given to me to makeover into Time Out chairs – one for Mom's house and one for Grandma's house. 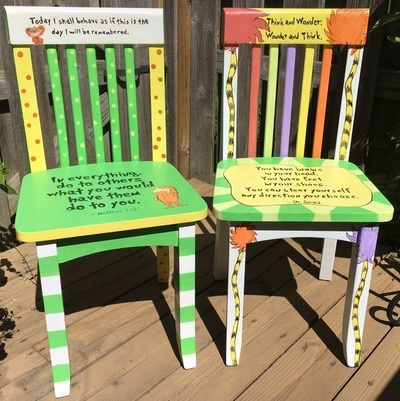 Mom wanted the chairs to be Dr. Seuss's Lorax themed and contain positive messages to be considered during the Time Out. I found this 1950s chair at The Greenmead Flea Market. 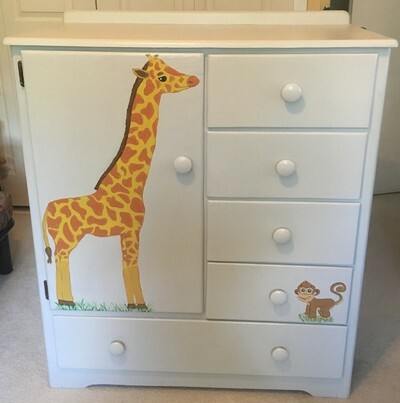 A dear friend found a similar chair design online and asked that I recreate and customize it for her granddaughter. I found this chair at The Old Furniture House in Warren, MI. I've really been inspired by the styles of MacKenzie-Childs and decided it would become my MacKenzie-Childs-style chair. 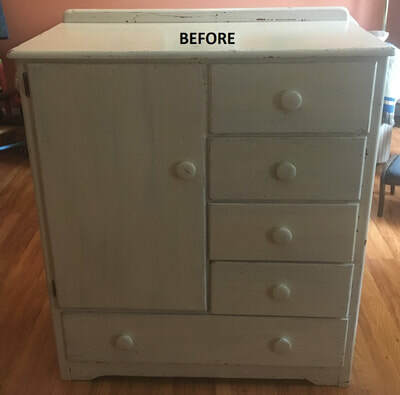 Once I began removing the old paint, I realized that three of the seat slats were cracked beyond repair and my antique furniture expert at Plymouth Furniture Refinishing suggested a rush seat replacement. Fiber-rush is a man-made twisted kraft paper that very closely resembles the natural rush historically used on Shaker style chairs, ladder-backs, Hitchcock and Hitchcock-style chairs, and others. It's a form of seating that's been around for hundreds of years, rush seats are comfortable and surprisingly durable. You can expect the seat to last 30 years or more. I've applied two coats of varnish to help protect the seat from spills. I believe this is a one-of-kind chair. I imagine some talented craftsman (or craftswoman) made it for a lucky child in their life. I found it at an antique mall in LaPorte, IN. The wooden barrel has strong metal brackets attaching the legs and wooden bands around the outside of the barrel. It's the ideal size for a toddler. The seat cushion and fabric have been replaced. This barrel full of monkeys now belongs to 14-month-old Lincoln. 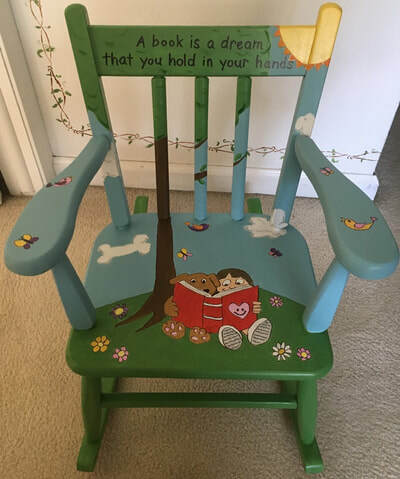 This chair was a special request from my cousin for her granddaughter. She asked that I include her three favorite Frozen characters (Elsa, Anna and Olaf). This chair was found at an antique barn and is believed to have been made in the 1940s. I felt it had a lady-like size and look and worked well for the intended theme. 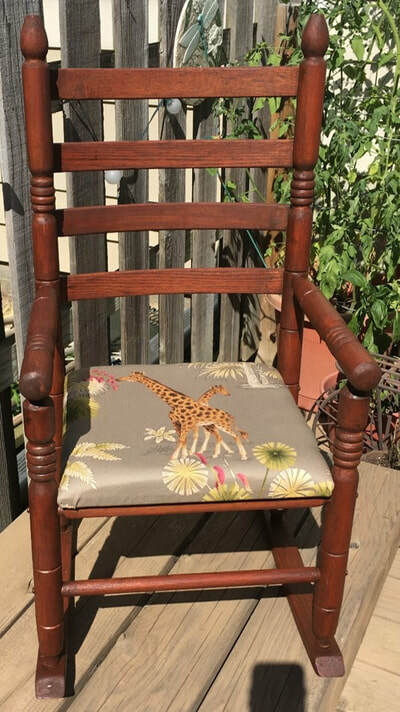 This sweet old rocker was purchased from a consignment shop specifically for this project. 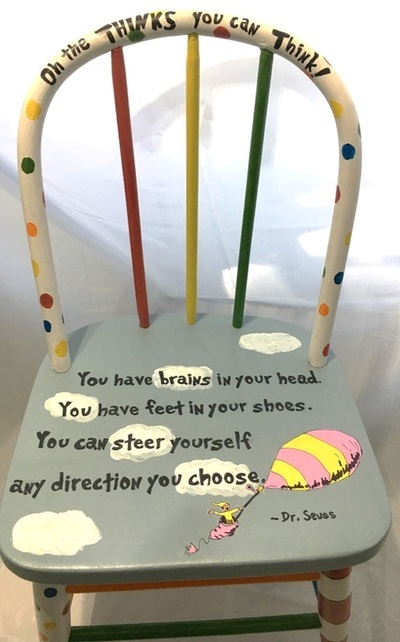 A friend asked that I design a reading-themed rocker for a baby girl's baptism gift. This set was a special request from a friend for her grandson. She asked for a non-gender-specific theme and I decided on laughing animals. 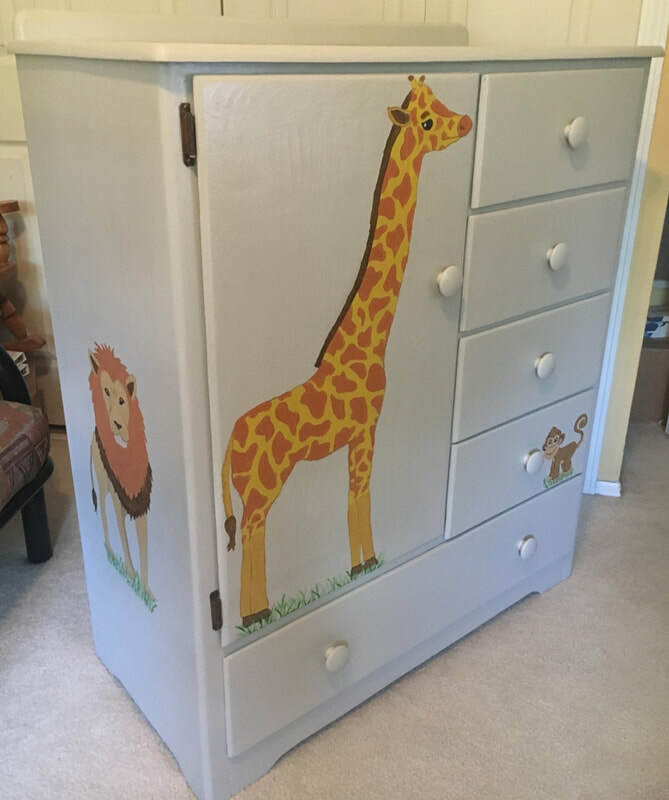 The table and one chair (giraffe) were garage sale finds and the previous owner said it was her childhood table in the 1940s. Each chair was found at different garage/estate sales and antique/consignment shops. I purchased this chair from Craigslist specifically for this request. 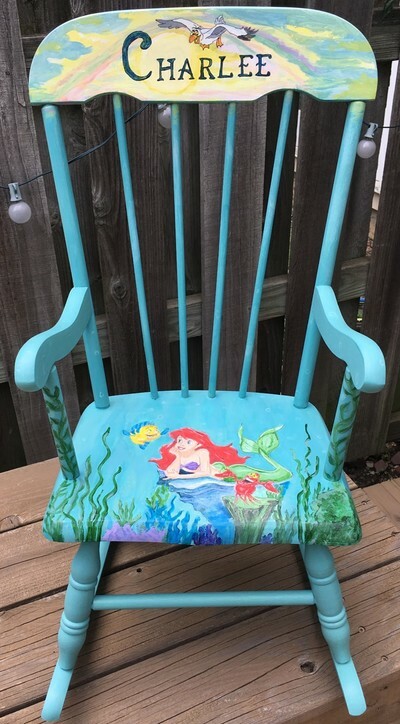 My friend wanted a chair to gift to her granddaughter for her first communion. I sent her several bible verses and chair designs to choose from and this is the final product.